In 2008 Adler & Allan (A&A) won what was to become one of the company’s highest profile contracts to date, right on the doorstep of its Stratford depot. Awarded by the Olympic Development Authority (ODA) A&A was tasked to run a robust and secure supply chain for fuel to the Games’ construction phase site contractors. “Our site fuel station was designed and implemented inhouse by an experienced team of fuel installation and supply personnel, expert in providing facilities and product to precise, measurable service delivery criteria, on an unusual and potentially hazardous site surrounded by waterways,” said A&A’s group marketing manager, Alan Scrafton. The company’s project manager, Colin Mitchell and his team were responsible for designing and building an efficient, removable fuel station close to the Northern Plaza, completing it well within the three month deadline given by the ODA. The station was later overlaid by hockey pitches where Team GB women won bronze. A&A Fuel Services under Dave Whiskerd and Mike Grayton managed the contract to supply over 25 million litres of fuel and associated products from the site, operating and manning the fuel station with compliant and trained staff to the high standards of safety and quality demanded by the ODA. “The site provided a simple to use, stable retail style fuel service with vehicle recognition capability for onsite customer collections, and also a base for two rigid fuel tankers making over 10,000 bulk deliveries all over the Olympic Park,” Alan told FON. Supervised by Maggie Lyons, the station became the company’s on-site base for the next three years, with fuel being bridged in from new Barking premises following eviction from its Stratford site to make way for the construction of a coach parking zone for the Games. “Security measures were high on the agenda, so operations had to be carried out under stringent security procedures and to specific timed delivery schedules. Most of the bulk tanker movements to replenish the company’s onsite storage facilities were carried out at night to minimise traffic issues,” explained Alan. 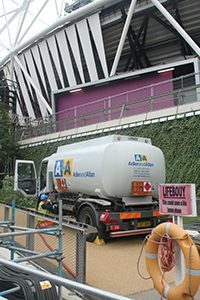 As the construction phase approached completion at the end of 2011, A&A was awarded the contract to supply on behalf of BP, all the fuel for the 600 plus generators providing main line and back-up power to over 40 Olympic venues around the country. This involved employing 12 rigid tankers on a 24/7 basis from May to September 2012, initially fuelling the generators and supporting bulk storage tanks, and then progressively replenishing through a robust testing phase to round the clock operations at the peak of the Games themselves. Throughout the project the company was required to operate to the highest HSE and security requirements and successfully completed over 2000 individual deliveries. “Ambush marketing clauses in the ODA’s contracts made it impossible for us to publicise any involvement in the Games, but we did benefit from being onsite with spin-off business in spill response, barge booming for stored fuel in the canal; hazardous waste and other industrial services throughout a hugely successful project. However, just recently there has been a relaxation of this so that British companies can reference their contribution and we have applied for a licensed agreement for London 2012 Supplier Recognition with the British Olympic Association. After supplying the Olympic rowing test events in 2011 WP Group was awarded the prestigious contract to install, supply and maintain the London Organising Committee of the Olympic and Paralympic Games (LOCOG) sport and logistic fuel for over 40 venues, including Olympic Park, Excel, O2, Eton Dorney, Weymouth and numerous football stadiums. Tailored to the unique requirements of each venue, the company’s fuel solutions team provided bespoke turnkey solutions designed with environmental safety and seamless operation at the core. The company also ensured all users from golf buggies to forklifts could fill and go, with little need for intervention or days of training. As the linchpin of the operation, WP’s Emily Hard, was seconded to LOCOG for six months, working full time at its head office in Canary Wharf where she co-ordinated the project and liaised with the Southampton-based project team. “The biggest challenge was co-ordinating the team across 40 different venues, each with its own unique and challenging requirements,” explained WP LOCOG project manager, Lisette Norman. “At times we were unable to gain site access until the eleventh hour which meant set-up efficiency was paramount. Each member of our installation team played a vital role in achieving optimal venue performance, they should be proud of their accomplishments. Ideally located in south west London, Linton Fuel Oils was also heavily involved from the outset of the project in 2007, supplying fuel to a number of construction firms working on the Olympic site. “We were very fortunate as many of the companies involved were local businesses and already existing customers,” said sales director, Neil Flynn. “Security was tight and fuel deliveries were restricted,” explained Neil. 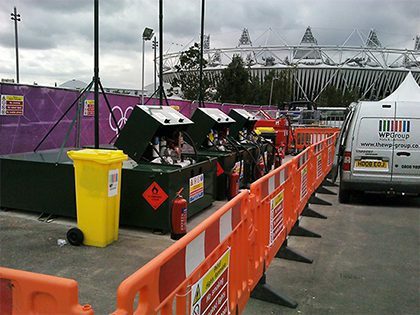 “We delivered fuel to two different sites – Olympic Park and Athletes Village, with holding points at Barking and Epping. Vehicles had to be booked in at the relevant holding point before a permit was issued. Each permit was accompanied by a specific time limit and if the vehicle got stuck in traffic and exceeded this limit, it was sent back to the holding point for a new permit. “We had to structure the business accordingly and meticulously plan deliveries. Our vehicles were on site every day to accommodate both venues, which wasn’t really the best use of our time. “During the games themselves, it was unbelievable. The government and media worked hard to keep people off the highways in central London, which in reality was the best thing for us. Many companies shut down entirely, there was very little traffic on the roads and there were no delivery restrictions in place so we were able to do our city deliveries quickly and easily. On the flip side deliveries outside London took longer and we were actually down on volumes for August as many customers closed for the duration of the Games. “It was an amazing experience though to see the changes unfolding and be part of such a special event,” concluded Neil. As part of an ongoing partnership with Scandinavian Bunkering, GB Oils’ supplied gas oil to the MoD police launches, Excalibur and the Endeavour, acting as patrol and support vessels for HMS Ocean, during the Games. The two vessels were also supplied with oil during the Queen’s Jubilee, demonstrating the distributor’s ability to meet demand during busy periods. A special mention goes to the Freight Transport Association’s (FTA) head of policy for London, Natalie Chapman, who was presented with an award by the Chartered Institute of Logistics and Transport for her outstanding contribution to the efficient operation of freight and logistics during the Games.